SUMMARY: Seventeen-year old Greta has been surviving in Mylena since she fell through a witch's fire four years ago. Since then, Greta has found a home with a wood sprite and become a fearless bounty hunter. Always on the lookout for a portal home, Greta has been doing well considering she's a human in a land of trolls, faeries, goblins, ghouls, and witches. When her beloved guardian is brutally murdered, Greta vows to bring his murderer to justice. But as she goes out to seek the demon Agramon, Greta discovers Agramon is already hunting for her, hoping to use her to expand his evil influence to other realms. With an eclipse threatening to turn fairytale creatures to beasts, the goblin king constantly invading her dreams, and a rag-tag group of human boys depending on her, Greta knows she must find Agramon before he finds her. WHAT I LIKED: Fun, fun, fun! 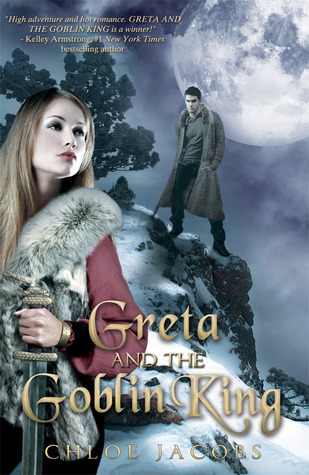 Greta is easy to get into and difficult to put down. Featuring plenty of action, romance, and ghoul drool, this book will be a hit for fans of Brandon Mull's Fablehaven series and Julie Kagawa's Iron Fey series. I have been so sick of paranormal romance lately, but Greta was refreshingly unique and just plain-old good storytelling. Original world-building! I love Jacobs' descriptions of the frigid, unforgiving land of Mylena. I could picture the warm glow of the bar where Greta encounters Siona, the makeshift stick tents Wyatt and the other boys put together, the drooly ghouls wanting nothing more than a light snack to calm their hungry bellies. I love the looming eclipse and what it does to the animals and creatures of Mylena. I love that the Goblin King and his cousin Siona are not the bony, hideous, grey-skinned creatures from other stories I've read; instead, both are beautiful and strong (and look a lot like humans). Faeries are not the delicate little Tinkerbell-esque flying pixies; they are huge, strong, and fearsome. Just. Awesome. WHAT I DIDN'T LIKE: There are two potential romances in Greta. Wyatt, a human, is very sweet, accepting, encouraging, and clearly likes Greta. I like him a lot and would love to see Greta end up with him (though I don't think that will happen). Although Isaac the Goblin King is interesting and gorgeous and powerful and understands Greta's personality well, his actions are stalker-ish. Greta is a tough girl who isn't afraid to do what is necessary to survive; I would think her character would be irritated by possessive behavior. While she does resist for awhile, she eventually gives in even though she acknowledges this is not a good relationship for her to be in. The "I love yous" come way too soon, which always drives me nuts. I prefer characters to have to work for the first kiss and the first "I love you." I like it when the author drags these out a little so I, the reader, can anticipate it and squeal when it finally happens. I didn't have enough time to savor the romance in this one; it was almost as though Greta just gave in to Isaac's advances rather than really wanting him on her own. The ending felt rushed and confusing. I found myself wondering--what makes Greta and her brother so special? Why does Agramon want them so badly? Perhaps these questions will be answered in the next book. THE BOTTOM LINE: Fun, fast-paced, and action-packed. It's not without its minor issues, but they are not big enough to distract from the fun of the story. STATUS IN MY LIBRARY: On order. My fantasy readers will love this!